You will need a freestanding mixer or a handheld mixer with a perfectly clean and dry bowl. You will need room temperature egg whites. You will need a sugar thermometer. Put your room temperature egg whites into a clean and dry bowl and set aside. 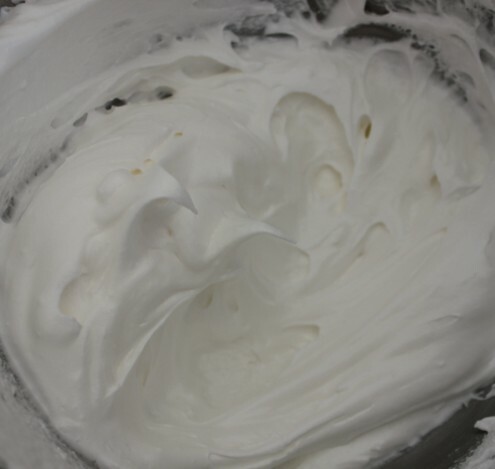 This will all be much easier with a freestanding mixer – essentially the egg whites should be ready to whisk. Dissolve sugar and water in a small saucepan and allow to begin to bubble over a high heat. You will need a sugar thermometer to measure the temperature. When the temperature of the sugar syrup reaches 110°C, turn on the mixer to full speed and whisk the egg whites to stiff peaks. Once the temperature of your sugar reaches 118°C, remove the saucepan from the heat and check that your egg whites are at stiff peak stage – this is done by removing the beater. With the mixer running slowly, gently pour all of the hot sugar syrup into the egg whites. Be careful not to pour syrup directly onto the beater as there is a risk that it will splatter out at you… and it’s hot! Continue mixing for a further 5-10 minutes as the meringue cools. Once the bowl containing the meringue is cool enough to hold your palm against, you can stop mixing. By now the meringue should be stiff and glossy, spreadable or pipeable on cakes or cupcakes. If you are feeling brave, you can add colour to your Italian Meringue using a chef’s blow torch. These are easy to get hold of and so much fun to use! The heat will caramelise the meringue in the most beautiful way – any texture that you add to the finish of your meringue covering will be picked up by the heat. Remember that while Italian Meringue starts with raw egg whites, these are essentially cooked by the addition of the hot sugar syrup. Of course, if you have serious concerns about serving uncooked eggs, this should be avoided.